CMV-2xtetO promoter replaced with pCMV-D2i promoter. Rabbit β-globin intron and WPRE inserted before and after insert, respectively. 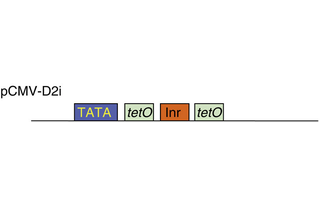 Initiator motif (Inr) displaced relative to pCMV-2xtetO (returned to its natural position). Two tetO2 sites flanking Inr motif. Mammalian codon optimized variant of eGFP gene from the pIRES2-EGFP plasmid (Clontech). Rabbit β-globin intron II-containing fragment from plasmid pcDNA6/TR (Invitrogen). Fragment containing WPRE from plasmid pLVX-DD-tdTomato (Clontech). Modified CMV-based synthetic promoter pCMV-D2i synthesized de novo (Bio Basic Inc., Markham, Ontario, Canada).